I'm introducing yet another new feature because they make my blogging life so much simpler. It's stolen, rather shamelessly, from Ms. Knitpicky, though I'm not going so far as to steal her rather awesome title for it (WIP it Wednesday). I'm hoping that once a month, Helen will jump in here with her WIP, but some people are very busy nowadays planning and rushing around, so if she doesn't, I'll have to understand. 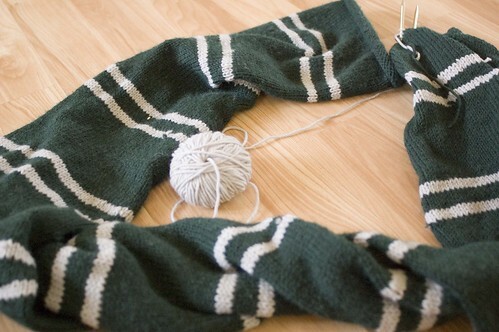 Remember that Slytherin Scarf I've been working on for over a year now? Yes, you do. How can you not? I always mention working on a row or two here or there. Well, I'm on section thirteen out of fifteen, so I'm finally closer to the end than the start. It looks decent, but it doesn't look as nice as Paul's yet. 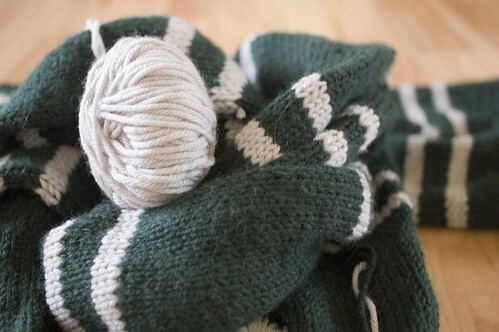 I stupidly picked an acrylic rather than wool yarn, so I'm thinking it'll never be as nice as Paul's scarf! When I'm done knitting this one, I have to get a photo of both of us wearing our scarves. If Paul has to broil in July for that picture, so be it. The next two sections might go a little faster due to my superstitions. I always try to hurry along when the number thirteen is involved since I always fear it will bring bad luck on my house. Let's hope that I can wear this scarf this winter. The possibility is not nil! I am a tiny bit afraid I'm going to run out of grey yarn before this whole scarf is done, so let's all keep hoping that if I do, I don't go crazy and try to knit the rest of the grey with scrap yarn from my yarn basket. Lastly, folks -- you're all crazy hateful of hunger. More than one of you is on an every two or three hour food schedule, and all of you get angry! I really am the only person in the world who doesn't mind hunger. You should all join a club with Paul that meets regularly for food. He can tell you about the times he's basically disallowed me from chatting with him while we wait at restaurants to get seated because he's grumpy and starving. I will not be joining you all since if the food comes late, you might attack! Haha! Just keep some emergency nibbles with you and you'll be fine. But yes, I think you may be an odd ducky with your like of being hungry. Ooh, you're close on that scarf! WIP it!